9:00 Saturday the Silverback Nation gathers. The workout format is just a little different but always challenging and fun. If you want to try CrossFit or our community for the first time Saturdays are always a great way to jump into the pool! 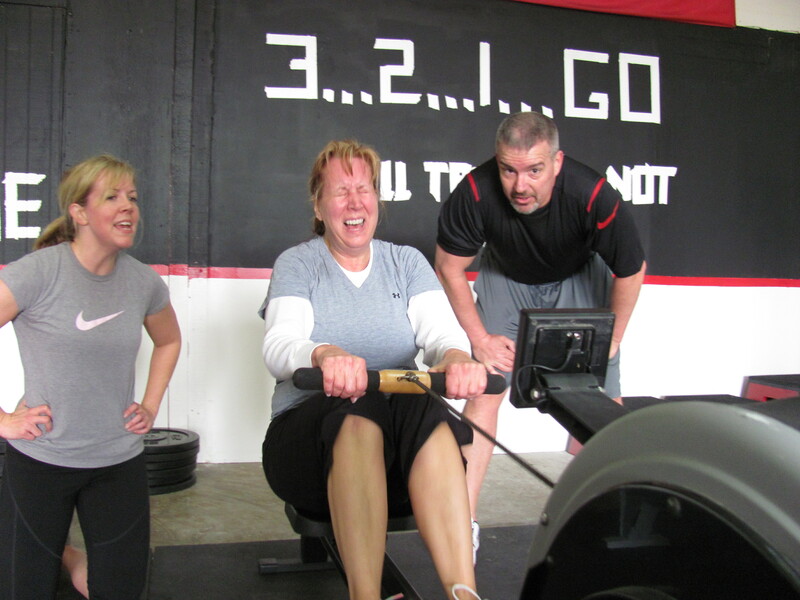 Athlete 1 is on the rower 2 on ASU and 3 on Squats. The team must collectively row the 2k. If an athlete pauses or stutters on the the movements they rotate positions (squats moves to rower, asu moves to squats etc.). Any member can call a switch at any time. Remember the longer you fight on the rower the slower you move and the more reps everyone does, too many transitions and you go to slow. With supporters in tow, Lynne finishes Silverback style: strong! That doesn’t mean we’ll be “swimming” again………does it? I liked the swimming thing! that was fun! Sorry but I’m camping w/the Scouts this weekend, C-ya Monday! Great workout this morning. Matt and Casey made a good team to set the standard. The shirts look great. Gong to the mall this afternoon just to show the off!! This workout was so much fun!! Probably not fair that I got to be Matt’s partner and he is a ridiculous rower. I also really enjoyed the warm up….the fast pace. I would like to see that as a WOD with like 3 rounds, which means Matt will make it 5 or 7………..nevermind. I LOVE my shirt!! I did get a lot of stares in Panera this morning…….that’s good! Matt, The marquee sign looks great! How did you get top billing? Can’t wait to get my t shirt Monday afternoon. Sound like workout was great! Sorry I missed it but had fun at swimming lessons. W/U jump rope 4min no consequences just working on skill! Wish I had my shirt for all of those people fishing who were staring at me! Just woke up from my “gorilla nap”. I don’t know which was more tiring: CF Silverback or chasing a 3 yr old while trying to watch my son’s lacrosse game. Chowed down at Fuddruckers with the kids and by the time I got home I couldn’t keep my eyes open. Now we know who the happy Leprechauns are!